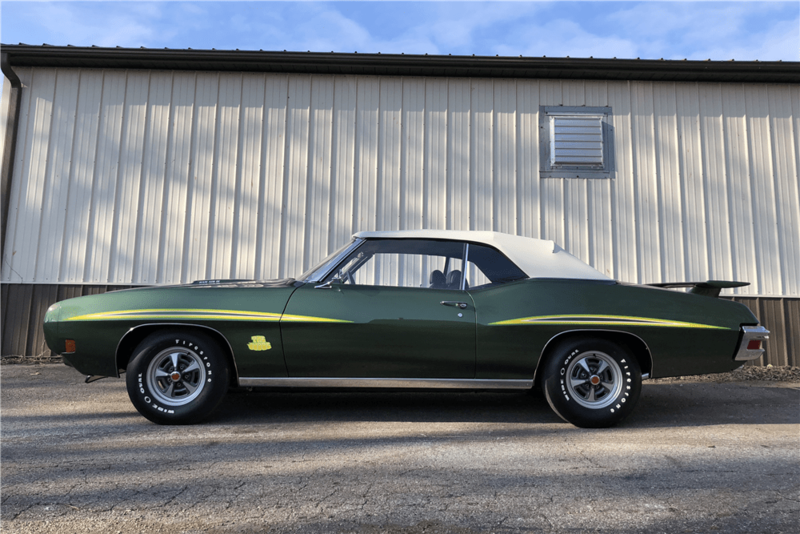 Lot #1412 – This 1970 GTO Judge convertible is one of 24 GTOs produced with the Ram Air IV engine and 4-speed manual transmission, which it retains to this day. It was built on February 3, 1970, at the Baltimore Assembly Plant in Maryland. Upon completion this car was then shipped to Lyons Pontiac-Cadillac, Inc., in Barre, VT, for delivery to the first registered owner. 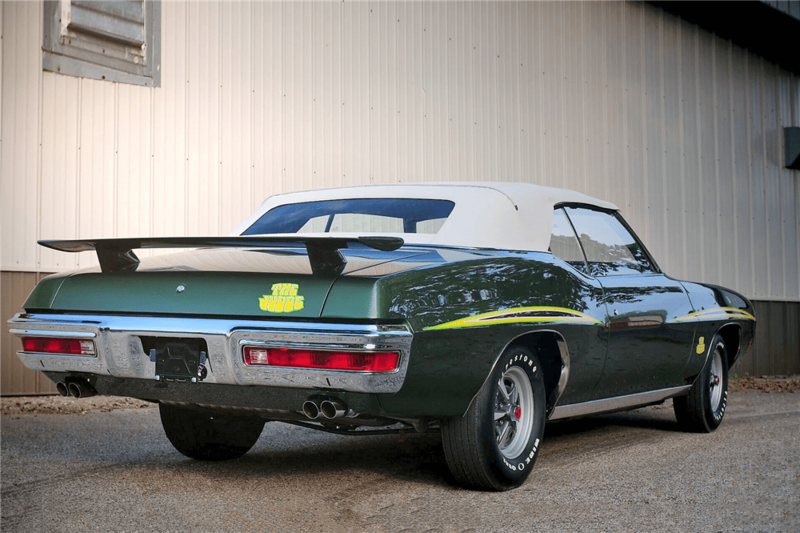 The current owner commissioned this Judge convertible to have a no-expense-spared frame-off restoration, which was completed in early 2017. The Judge was completely disassembled and stripped to bare metal, the frame was removed, and the entire drivetrain was rebuilt. The body of this vehicle was gone over from front to back, and the body fit is laser-straight. Once the body was prepared, it was given a fresh coat of the correct Pepper Green paint using the best modern DuPont base coat/clear coat paint. The black interior and white convertible top were carefully done as well. The frame was stripped, and all chassis components were either replaced or refinished in the correct original factory finishes. All restoration work was professionally done. The original Ram Air IV engine block was honed, and new pistons, rings and bearings installed. The crank was checked and lightly refinished. The Ram Air cylinder heads were checked and given a valve job, along with new valves and valve springs. Everything was reassembled, and the entire engine assembly was given a coat of the correct Pontiac engine paint. The interior was completely redone with nothing but correct materials. 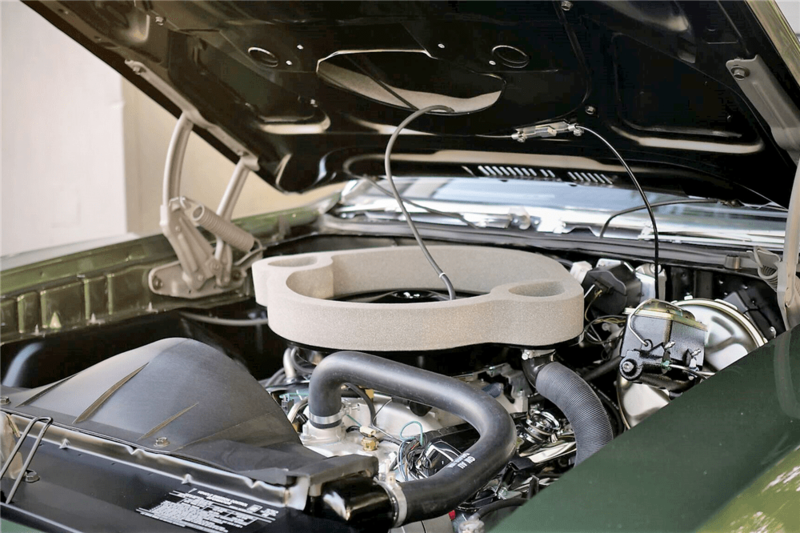 All instruments and gauges were checked for operation and repaired or replaced if necessary, all wire harnesses were replaced with new ones and, where possible, NOS parts were extensively used. The restoration on this GTO is factory-correct, down to the correct T-3 headlamps and original-style Firestone white-lettered tires. Upon completion, this car received the top Concours Gold Award status at the 2017 GTOAA National Convention. Additionally, in November 2017 it was awarded the Concours Gold at the prestigious Muscle Car & Corvette Nationals, in Chicago. The car comes with a complete set of Pontiac Historic Services paperwork, original Build Sheets and Pontiac Division Window Sticker.